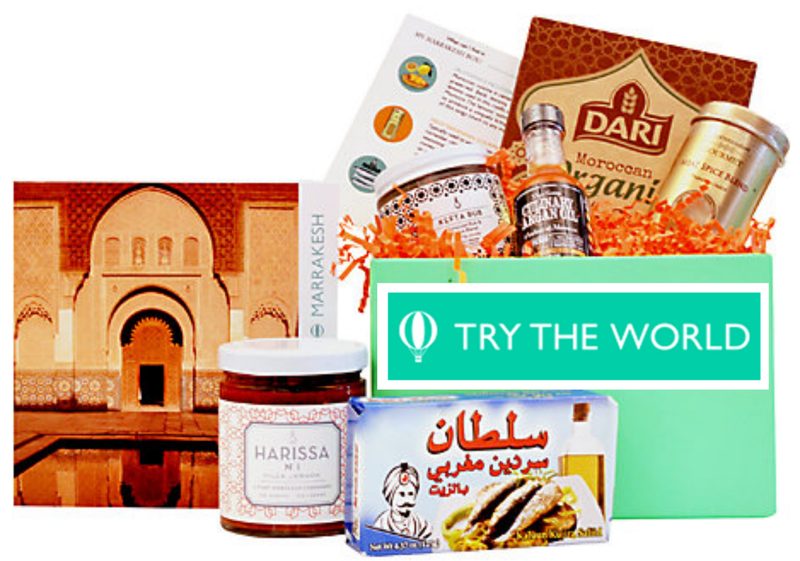 Try the World is a bi-monthly subscription box that sends traditional foods from countries all around the world. Each box features one city and 6-7 gourmet foods typical to the area. I received the Paris box and really enjoyed it. I think the presentation is fantastic but the value was a little low. However, with the Rue La La deal, it's only $25 which is a great deal. By using the Rue La La deal, you will be signing up for a subscription but it's easy to cancel if you so choose. This box is shipped every other month and you'll have until July 2nd to use your voucher. The box currently shipping is Marrakesh but you could wait until they announce the next box, too. You will have to sign up for a Rue La La account to take advantage of this deal. It stinks but that's the way it is. They actually tend to have subscription box deals fairly often so it's not as bad as you think to get stuck making an account. Glossybox is on Rue La La right now, too. Get a FREE Paris box when you sign up for Marrakesh. Quantities are limited. Use this link to get the offer. You'll see at the top it will say clearly that you will be receiving the Paris box free. The link takes you right to check out and if you browse the site, the offer may pop back up for you. If it doesn't just come back here and re-click since I'm not positive on how to make it show up. I got the deal the site had for the Venice Box and the Marrakesh box. I received them both this week. The Venice box was a huge disappointment for me: Olive oil and a jar of anchovies were the highlights. Oh, and a tiny bag of coffee for those who drink coffee ( I don't). There was a booklet with a recipe for a pasta with the anchovies and the olive oil. The Marrakesh box was similar. There was a Cous Cous sauce, and a tin of sardines. I don't eat this type of things, and gave both complete boxes to my housekeeper, and while you ( and I) have learned our lessons about small organic sub boxes, I also learned my lesson about vaguely described food boxes. If someone loves anchovies and sardines, this should be a great sub for you. I was insulted by the cheap ( and yucky) ingredients and cancelled. I'm glad the Paris box is apparently different. I still wouldn't risk a subscription though. I felt extremely let down by what they sent. There were no yummy ready to eat treats in either box. Just spices, the seafood tins, some sauce. I do feel that it depends on your tastes completely. I am not a super adventurous eater but my husband is. The Marrakesh box is not anything I would be interested in but my husband would LOVE it. It is totally his style. When I subscribed last year, all the box contents were shown for all the boxes for the entire year. I only got the Paris box because I wasn't interested in anything in any of the other boxes. I noticed they've switched that up a bit and no longer all the contents for the year. I do totally agree that the products could be more high value or higher quality. I'd love to see them improve in that area and it's disappointing to hear that you felt the products were still cheap. Food boxes really are tough. And they tend to be way overpriced. Mantry has high quality products geared toward men but you're paying a pretty high premium. My husband loves it but I refuse to pay full price for it just on principle. Hamptons Lane is another one that does food but is also never quite worth what you pay for it. I'm so picky it's not really worth getting any of the artisan food boxes. The Hatchery was so disappointing I couldn't even bring myself to blog about it. At least with Love with Food, I don't have to feel like I wasted money if I hate something. So I stick with my snack boxes. I like Global Delights and Universal Yums for " exotic" snacks. And Something Snacks and Love With Food for more " regular" type snacks. I've subbed to BoCandy but they haven't sent me anything yet. Sigh. I'm not picky except that I won't eat fish that is what I consider to be cat food quality. I miss the couple who owned Knoshbox so badly it's not funny. WONDERFUL box.. they went to Fancy Box food after shutting down their own box, but now they're gone from Fancy too. BIG, themed boxes like " A Picnic in the Country", " Sweets at the Fair" with cotton candy and oh, so cute and wonderful things.. They set the standard so high.. then left.